Bentsen State Park is a popular running spot for local runners. No matter the skill level, there are many areas scattered throughout the Valley suitable for all ages and expertise when it comes to being one with the outdoors. The locations listed are a few of the most popular running or hiking spots nestled within the tropical terrain of the Rio Grande Valley. Just a minute. Before going on any type of rural adventure- be it hiking, walking, running or cycling- necessary precautions must be taken. Runners, hikers and bikers might benefit from carrying the following: plenty of water, sunscreen, safety equipment (such as helmets or whatever might suit the activity), bicycle repair equipment, reflective clothing and proper footgear. The Mission Trails provide access for hiking and biking along a five mile paved trail that runs into the World Birding Center. Set in a secluded area free from cars and traffic hazards, it’s suitable for walking, running and cycling. There are trails designed for beginner and expert adventurers with convenient signs indicating the level of difficulty per trail. Single track trails are scattered throughout the park for those who want to put their hiking skills to the test or for mountain bikers who enjoy rugged terrain. The trails are open 24 hours a day. For more information, call (956) 583-5996. The McAllen Hike & Bike Trails run on two separate tracks – one along Second Street and one along Bicentennial Blvd. The paved, winding paths are suitable for runners or walkers not keen to rocky or rugged terrain. Since the trails are cement, the paths are also open for bicyclists. There are areas that see heavy traffic along the trail, but these areas provide fair warning with crosswalk sections for pedestrians. The paths are lit by streetlights and are far from the busier streets they parallel. Various painted displays and art pieces can be seen along the way to keep the senses engaged. Estero Llano Grande is a state park in Weslaco. Home to some of the most exotic and rare migrating birds in the world, it’s one of nine locations of the World Birding Center. Bird watchers flock to the park in hopes to catch a glimpse of some of their favorite birds through the eyes of their binoculars. 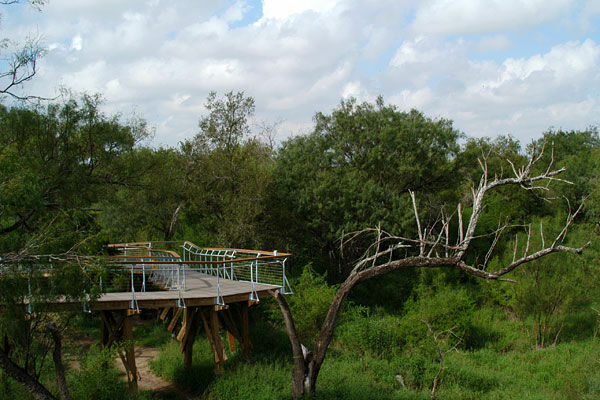 The park has many trails suitable for hikers, backpackers, bicyclists and runners and acts as a 230-acre refuge to many South Texas creatures. Guided tours, camps for kids and other family activities are provided. The park is open from 8 a.m. to 5 p.m. Wednesday through Sunday. For more information on trails or educational programs, call (956) 565-3919. Just outside Mission, the Sullivan City Trails range anywhere from 7 to 15. The trails are popular to running groups and various running organizations throughout the RGV, so preparation to join a group ahead of time could be worthwhile. The trails are unpaved, typically set in hard dirt or caliche, and encircle several different wooded areas. The trails are sufficient for biking, but since the terrain is rough, park officials suggest bringing necessary tools to fix a bike tire flat if needed. Bentsen State Park is another popular park for birdwatchers. More than 525 rare birds have been spotted within the park, making it one of the most visited parks in the nation. Apart from its dense bird population, the park has many wooded trails and bike paths. Bicycles and binoculars can be rented for the day, and trails can be trekked alone or along with a park ranger, depending on scheduling. Since there are guided tour options, the trails can be a bit busy, but there are plenty of solo trails ideal for runners. Entrance fees are $5 for adults and free for children under 12 years old. The park is open daily from 7 a.m. to 10 p.m.